… At least to me they are! One thing I’ve noticed, being in a quilt guild, is how generous most quilters are. They make and give quilts to friends and family members… and to many different charities. It’s part of why I love the quilting community – they really want to wrap the whole world in love by way of beautiful quilts. Many years ago, I was a recipient of one of these quilts. It’s a simple block quilt, hand-tied in yarn… and as you can see, very well used. I got this quilt when I was staying at a homeless shelter, right after I found out I was pregnant (1990). I had been squatting abandoned buildings or sleeping outside for about 6 months, then got into the Waller Street Family Shelter in San Francisco. While it was not the most pleasant experience of my life, staying there for a few months allowed me to get myself into housing before my daughter was born. My daughter used this quilt while growing up, and so it has been well loved and very used. It means even more to me now that I quilt too! I want to repair it. The bright colors always remind me that there can be bright lights, even in darkness – and that some random, unknown person is out there trying to help by wrapping us in love. As a charity-quilt recipient, I just want to say: “Thank You!” to all the charity quilters out there who diligently work to make others feel loved and cared for. 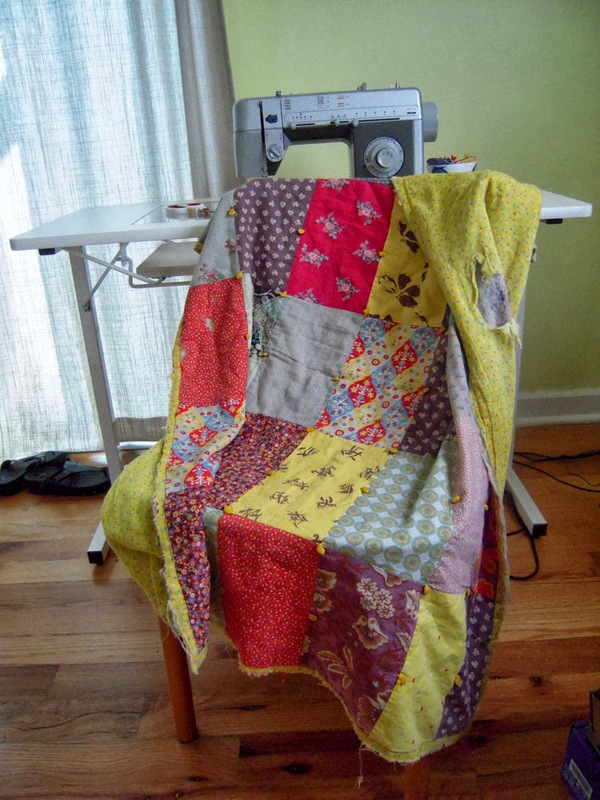 You and the quilts you make, are very important and really do matter to a lot of people – like me!